BSA The most popular M'cycle etc. Workshop Banner Art. 48" or 72". A BSA 'The most popular motorcyle in the world' workshop Banner using the styles from the 50's & 60's. Great for decorating workshops, garages, sheds, etc. Available in 2 sizes measuring approximately 1200 x 400mm ( 4ft x 16"( or 1800 x 600mm (6ft x 2ft). Printed on top quality banner material 450gsm thick. This creates a water and weatherproof poster which can be used inside or outside with no deterioration. These banners are not hemmed. They make excellent gifts for that hard to buy for buddy, partner or fellow enthusiast and are a great way of repaying favours. BSA Piled Arms Stickers. Detail Cut. For Dark Background. 2" or 2.5" Pair. 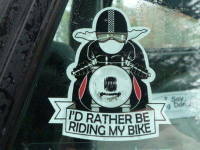 BSA Piled Arms Stickers. Simple Cut. For Dark Background. 2" or 2.5" Pair. Hap Alzina BSA Distributor Oakland California Sticker. 2.5". 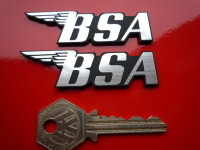 BSA Laser Cut Self Adhesive Bike Badges. 1.5", 3" or 4" Pair. 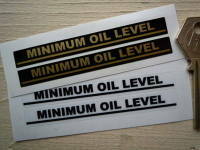 BSA Piled Arms Stickers. Detail Cut. For Light Background. 2" or 2.5" Pair. BSA Piled Arms Style Laser Cut Self Adhesive Bike Badge. 2.5". BSA Shaped Red & Gold Stickers. 4" or 6" Pair. BSA Red & Gold Oval Stickers. 2", 3.5" or 4.5" Pair. 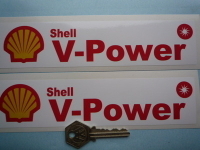 Shell V-Power Oblong Stickers. 8" Pair. 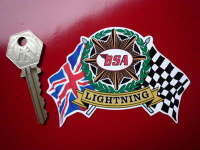 BSA Flag & Scroll Various Models Sticker. 4".